Your satisfaction is always our top priority! This is why we would like to know your impressions of our services. 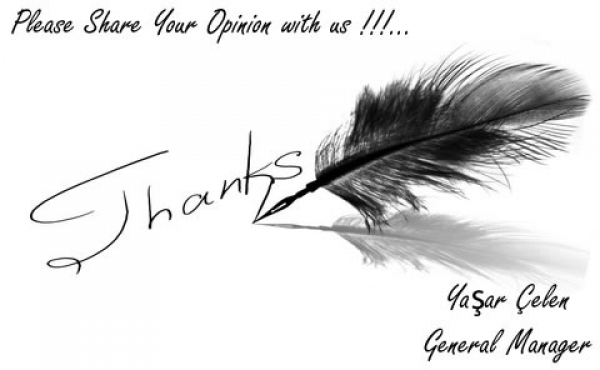 Your opinion isn't only welcomed but also important for us, in order to improve and evolve our services! We guarantee that all reviews will be posted. Do you recommend us ? I plan on visiting Istambul often, and will always use your services - as well as recommend it to friends. weather circumstances were difficult (snowfall). We were very delighted for the whole package of service and highly recommand this driver service in Istanbul. We are very happy with the service provided to us today. The driver was punctual, very polite, courteous and most importantly professional. We definitely recommend this company for transfers! driver was really kind to us and arrived on the right time. Also waited when we were doing our check out. I used their service on 24th Nov and 27th Nov 2014 From and to Istanbul airport with my family. The service was smooth as silk. I have found them in the airport reception area easily, the car was clean and specious and Driver was a gentle man. The rate is very competitive than those hotel car. Just a quick suggestion that they can think about the attire of the guy who receive the guest on airport. Little more formal dress will add value to your brand. And may be a bottle of water upon arrival can be considered. However,I am suggesting these because I am satisfied on your service and want you to be more successful. Fast, sharp and confortable transfer at convenient price. Ho prenotato un paio do viaggi da e per l'aeroporto. In entrambi i casi il servizio dalla prenotazione al trasporto e' stato veloce e puntuale. the car and also very easy to find our name just exiting the immigratiion at the airport. Excellent service even for a pickup at 0500 they were punctual. The van was clean and the gentlemen were very kind. Excellent return transfers from IST and to SAW airport(s). The 1st transfer was quite speedy during first trip (by night to the hotel), maybe too much. The 2nd transfer back to the airport was excellent with a very nice guy very friendly and professional. A representative was waiting at the assigned spot in the airport when we arrived. The vehicle was in excellent condition and the driver was friendly and courteous. The vehicle was allowed to enter a restricted area and able to drop us at the door of the hotel, which would not have been possible by taxi. Hi, the service was good : on time at the hotel for the pick up, good driver, the car was comfortable. We arrived early at airport, maybe we could have gone 1 hour later, but I assume it is difficult to know withthe traffic jam. Excellent service provider. Strong communication and immediate confirmation, good response to email question. Driver was on time and well signposted. Vehicle good. Excellent door to door service. Highly recommended. The shuttle was excellent and we are very happy. Service was fine. I was met on time and not hassled for any tips. Pick up was waiting at wrong location. Very nice. Easy transfer with the guy waiting for us to take us to our driver and car. 2.5hrs later - with bad Sat eve traffic and rains arrived to our hotel on the Asian side - patient, kind driver and nice conversation along the way. Thank you very much!!!! I'm very pleased how you make transfer booking comfortable for your clients! I wanted to sincerely thank you for all your help organizing our tour to Cappadocia and Pumukkale for us. Thank you sooo much for the upgrade to the MDC hotel, it was absolutely wonderful. We were so grateful to stay at such a beautiful place. Thank you as well for changing bus routes for us at the last minute, allowing us to visit Ephesus. We were very impressed how fast you were able to rearrange the bus route change for us. Thanks to you, we had an amazing vacation. Everything was so well organized. We were happy with every part of it. THANK YOU so much!!! We will always remember our trip to Turkey. I will tell everyone to use TTG Travel. In fact, my parents would now also like to do a similar tour. I will send you an email shortly with details as to what they are looking for. Thank you Alina for all your help!!! Transfers to and from airport for 13 persons were organised very well. Good drivers, bus was comfortable for 13 persons. Thank you. Everything was fine. I hope that our pickup Time on thursday at 15:30 was also Perfect! Good service, departing from the airport was a bit delayed due to "uncoordinated" organization and mad bustle at the airport. Drivers are friendly. Been very punctual locally upon collection. I would like to thank you for the care you are showing, my family and I had an excellent transfer with your superior service, the greetings, drivers behaviour, vehicles cleanness were all excellent, the comfort of the car allowed us to enjoy the road and have a good start sightseeing from SAW to the Old City, Istanbul is a very beautiful city and we do enjoy our vacation there, your transfer service allowed us to start feel comfort since arrival. The transfer was, as always, perfect. I have been using your service for many years now and remain a happy and satisfied customer. In fact I need a car tomorrow from the Swisshotel Bosphorus to the airport (ataturk) at 12.45pm. Could you please arrange that and confirm to me? Many thanks for your attention rendered to me during my recent visit in Istanbul. I wanted to meet Mrs. Flament but that didn't happened, so I booked some regular tours and cruises from the hotel desk. As to the airport transfer services you offered I was really satisfied. Good and polite drivers (but not English speaking), nice and clean cars (but too large capacity for only one person - I'm thinking of the costs involved). Special appreciation and thanks to Miss Ozle (correct?) for helping me with her advice when I changed the hotel and for patience showed to me. Nice, kind and charismatic person. I intend to come one more time (if possible) till the end of the year, so we will be able to meet again. The ride from SAW to Istanbul went smoothly. The van was comfortable and we had a safe driver. One thing I would like to say though is, I assumed we would have the car to ourselves (we were 2 persons) and not share it with anyone. When we got out of the arrivals lounge, the driver rushed us to the car as there was another couple waiting for us. I wanted to visit the tourist information counter and wanted to buy an Istanbul Card but, didn't get a chance to do so. I would still recommend your company, but would also recommend that the driver ask if we wanted to do anything before leaving the airport whether it is late or not. Many thanks for your kind email. We have been very pleased with your greetings, drivers behavior, vehicles cleanness and comfort. Would anytime choose and recommend your company. The airport transfer was very good and I was pleased that me and my wife we could enjoy the view of the seaside during the transport to the hotel. My request is to conform me the transfer back to the airport on 15th of September. Thank you, Yasar, the transfer went very smoothly and we will certainly use you again as and when we visit Istanbul. No complaints! I'm glad to travel again with your company. Thanks for your email. Overall, I enjoyed the company's service. The car was good, the driver was friendly and the price was good too. I will definitely use the company again for future purposes. Thank you Mr. Celeb. I am happy with your transfer services in Istanbul 3 times this year. I shall certainly be returning to Istanbul hopefully within the next 12 months and will definitely be using your services. Happy to inform that every thing went fine starting from the airport transfer . Our drive Erkan was a great driver . The car was clean all the time and we are happy to use your services in our future visits to güzel Istanbul . When we arrived at Istanbul it was difficult to find our person to connect to. I called and then we were able to meet up. The drivers, car and service was excellent, very professional. Fridays arrival was very bad traffic but no fault to your company. Tuesdays return was very good on all parts. I would highly recommend your service to anyone needed transport in Instanbul. I will recommend your companay to everybody who is traveling to Istanbul. I will also place your company on an internet forum talking about Istanbul. One tip, maybe it's an good idee that the drivers talk English. Everithing was good,I will recommend to my friends. We have been on a cruise and have just returned so had not been able to reply. We were extremely impressed by Amandine who helped us when we're unable to print our voucher. She was friendly and immediately fixed our problem. The gentleman who collected us to take us to the airport was on time (if not 5 minutes early) and drove us straight to the airport helping us with the bags at each end. He waved goodbye as he left. Very impressed and would recommend you. We totally enjoyed the transfer experience. The car was nice and clean, and the driver was really polite and his driving skills gave us a strong sense of confidence during the busy Istanbul traffic. We will definitely recommend your service to friends and colleagues. Hi, I would like to thank your warm welcoming service when I came to Istanbul 2 weeks ago. I'm going back to Korea this Saturday night and I would like to ask for your help again this time. I'm staying in Limak Eurasia Hotel and planing to leave at 9:30PM from the hotel. We are 3 members of groups like last time. I believe the price would be 70Euro like last time. We were very pleased with your services, and will certainly revert to you again when we go to Istanbul again. I want to thank you for your excellent service during both transfers in Istanbul. Truly professional at a reasonable rate. In both cases, the board with our name on was clear, the person who met us & took us to the driver was friendly & courteous. Both times, drivers & vehicles were very professional, clean & we felt safe travelling with them. I special thanks to the driver who collected us on the 24th - it was a hot day & he stopped & bought water for us, no charge! That was really considerate & I would recommend your services to anyone without reserve. I am glad to be of help to you. One think I forgot to mention is that very professional lady working for the company; Ms. Amandine; who was indeed very helpful at all times. We arrived home safe and sound, but were very sad to leave. I have fallen in love with Istanbul, and look forward to returning very soon. Our transfers were excellent, even if our flight was slightly early, waiting was no problem. Regarding both journeys, the vehicles were comfortable, and the drivers most helpful, although we did feel sorry for the driver on our return transfer, as the traffic was so bad. Glad we were picked up early. We will not hesitate to use your service again when we return. Thank you for your message. Here is the Renata husband writing. The services are 100%. My wife include ask me if the car was all for us because it's not normal to have a big car like that just for 2 people. If is valid an advice, leave some water bottles inside the car. After a flight and a long wait to bring the bags, the travellers just need water. Could be a nice improving for your services. Thank you and I expect to use your services again. The vehicle was good and the driver's behavior and driving skills were excellent!!! We appreciate having the reservation for your service for a 9:00 AM pickup on Tuesday, June 24, 2014 from the Antea Hotel to Ataturk Airport. We were very pleased with the service of our transfer. As well the kindness of the driver as the cleanliness and technical state of the vehicle. The only suggestion I would advice you is to work with voucher for the transfer on the eay back... the driver did not know that we already payed for the complete trip. It was solved within minutes and one call, but could be done smoother. Further everything was perfect and we will choose for your service again next time in Istanbul. Transfer servisiniz son derece başarılı. Havalimanında karşılama, şöför arkadaşın tutum ve davranışrı son derce saygılı ve seviyeli. Bundan sorna bütün arkadaşlarıma sizi tavsiye edeceğim. My transfers went well, at arrival there was a small problem, did not find the driver at all, had to call your office and tell where I am waiting for and then someone appeared.. this person did not speak much English and first it looked like the transfer would have been in a buss with a group instead of a private car but after all went Ok, even the trip took long time because of the demonstrations, but driver was having good nerves for delay.. I would like to express my thanks at the great work you and your team. I am using the services of your company more than once and want to mention punctual and polite drivers. This was such a great experience. The transfer was perfect. The driver was very professional and kind. I will add your service to TripAdvisor. We were completely satisfied with your service. Vehicle and driver were on highest level. I wish you a lot of satisfied customers. Best Regards and sorry for late reply. We had a very good stay in Istanbul and enjoyed your beautiful city. We don´t have complaints at all about the greetings, drivers behaviour, vehicles cleanness etc. Only on the return to the airport we had to make a phonecall because the driver was not right on time. We were a little bit worried because the airport of Sabiha Gocken is a long time drive. But after this call all went well. When we are coming back to Istanbul be sure we will contact you again. Die Abholung vom Flughafen klappte ebenso perfekt wie der äußerst pünktliche , individuell bestellte Transfer vom Hotel zum Flughafen. Sabiha Gokcen Airport-Lost and Found How to get from Ataturk airport to the city? How to get from cruise ports to the city? Istanbul Airport Shuttle Istanbul Airport Transfer Ataturk Airport Transportation How to meet at Ataturk airport How to meet at Sabiha Airport Is there any additional charge for my airport transfer service? How to get from Sabiha Gokcen Airport to the city?